CNG: eAuction 438. GERMANIA SUPERIOR. Æ Dupondius (27mm, 11.23 g). Countermark applied during the reign of Nero, AD 54-68 or the Flavians, AD 69-96. 438, Lot: 330. Estimate $100. GERMANIA SUPERIOR. Æ Dupondius (27mm, 11.23 g). Countermark applied during the reign of Nero, AD 54-68 or the Flavians, AD 69-96. 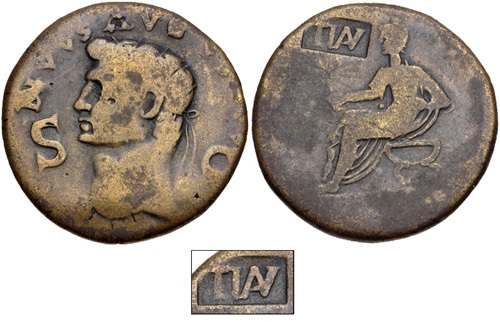 TI (AV) in a rectangular countermark on an imitation bronze dupondius of Divus Augustus. Pangerl 54. Host Fine, c/m VF, brown surfaces. From the Richard Baker Collection, purchased from Joel L. Malter, 1983.